As Dylan fandom knows no bounds, a couple of years back I came across Linda Mason Sings Bob Dylan. Privately pressed and released in 1964, it is the earliest known Bob Dylan artist tribute LP. If you’re interested in its contents, Heirloom Records just scored a couple of sealed copies linking to streams of both sides A and B. I’ll hold the editorial save to say that while Mason’s renditions may come off like a less impressive Bonnie Dobson, she does get points for ‘first’. Which brings us to Odetta Sings Dylan. 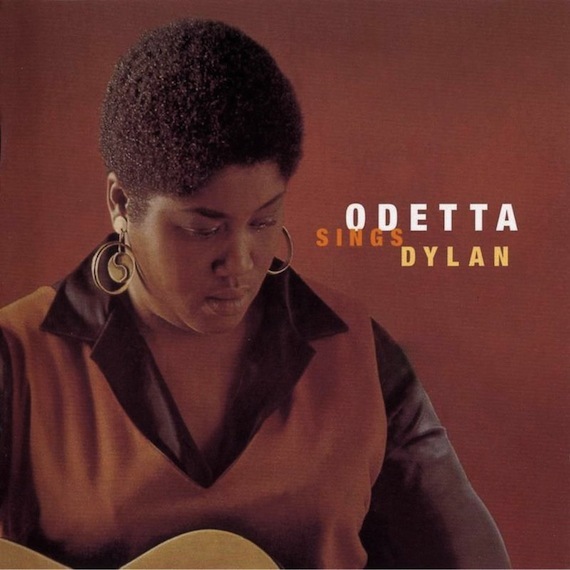 Released in ’65, a few short years into Dylan’s career, I long assumed the Odetta record was the first time an artist covered a Dylan LP in its entirety. And while that may not be the case, it certainly does remain one of the most effective. Case in point: the tracklisting – Odetta dug deep. In addition to the usual suspects one would expect, Odetta included a number of Dylan nuggets that even now, 45+ years later, remain obscure to the casual fan. “Baby, I’m In The Mood For You” – a highlight of the set – was a Freewheelin‘ outtake and at the time unreleased. See also: “Long Time Gone” – a 1962 track that wouldn’t surface commercially until the release of Dylan’s Bootleg Series, Vol 9: The Witmark Demos. Aside from the grace Odetta imbues into the material, the record is an interesting listen from a musicological perspective as Dylan was a student of Odetta’s work. As such the fit could not be more natural. Here’s a taste. In Odetta’s hands “Baby, I’m In The Mood For You” ditches the frenetic energy and harmonica of the original. Slowing it down, adding percussion and rhythm, she gives the song the body it never knew it was missing. And in turn gives it a soul. Great record!! Odetta’s “Tomorrow is a Long Time” supposedly influenced Elvis’s wonderful rendition. All of those interested should give both a spin. I was unaware Dylan was a student of her work! Fascinating….don’t know if I agree (all due respects y’all) that she gave it a body/soul it lacked, though she certainly left her own imprint thats for sure. Almost every performer from the 1st wave folk era would say they owed Odetta. She was the first influence Janis Joplin mentions. She and Josh White showed how and what a serious solo cabaret performer could emote in the folk mode, moving the trend away from “good-natured” shows like the Weavers and the Kingstons. Those groups sang for good causes and advocated peace, but they didn’t scare the sh*t out of you. Odetta could, and did.